Genre: Gaslamp/Steampunk, Fantasy, Adventure, Romance, Mad Science! The Industrial Revolution has escalated into all-out warfare. It has been eighteen years since the Heterodyne Boys, benevolent adventurers and inventors, disappeared under mysterious circumstances. Today, Europe is ruled by the Sparks, dynasties of mad scientists ruling over–and terrorizing–the hapless population with their bizarre inventions and unchecked power, while the downtrodden dream of the Hetrodynes’ return. At Transylvania Polygnostic University, a pretty, young student named Agatha Clay seems to have nothing but bad luck. Incapable of building anything that actually works, but dedicated to her studies, Agatha seems destined for a lackluster career as a minor lab assistant. But when the University is overthrown by the ruthless tyrant Baron Klaus Wulfenbach, Agatha finds herself a prisoner aboard his massive airship Castle Wulfenbach–and it begins to look like she might carry a spark of Mad Science after all. Stand alone or series: A novelization of the first omnibus of the ongoing Girl Genius webcomic – can be read as a standalone or as a companion novel to the first three issues. Why did I read this book: Adventure! Romance! Mad Science! I love all those things, almost as much as I love Agatha Heterodyne, whom I had the immense pleasure of meeting last year during our official Book Smuggler Steampunk Appreciation Week. Ana and I both loved the first omnibus, but had no idea that a novelization was in the works – so when I saw this book on Night Shade’s roster, I had to have it. In an alternate vision of the Industrial Revolution, clankmen, skyships, jagermonsters, and mad science abound. Agatha Clay has always felt a passion for technology, but has never been able to create mechanical inventions that actually, well, work. Despite this deficiency, her scatter-brainedness, and tendency to get intense headaches, Agatha has managed well enough for herself. With her loving foster parents and mentor at university, Agatha has managed well enough – but when Baron Klaus Wulfenbach visits town to demand the results for his specified invention, everything is flipped upside down for young Agatha. After having her family heirloom locket stolen away earlier that day, Agatha is puzzled by the reactions of her mentor and family – for they seem more concerned that her locket has gone missing than any of the other ensuing tragedies. When strange new machinery is unleashed on the town, Agatha’s home is traced as the (unwitting) source – turns out, whoever has created the new clank must be one of the most powerful “sparks” in years. The tyrant Baron and his sardonic son Gil whisk away to Airship City an unfortunate foot soldier whom they erroneously believe to be the spark, and Agatha, whom they erroneously believe to be his lover (thanks to the fact that she has been sleepwalking in her underwear and in close proximity to the soldier). Both father and son, and everyone else, are painfully mistaken, however – for Agatha Clay is actually Agatha Heterodyne, powerful descendant of the Heterodyne heroes! When Agatha’s nature as the true spark and her family heritage become known, the budding girl genius finds life has become incredibly complicated, filled with deranged hero-types, arrogant Baron’s sons, talking cats, killer wasps, and many others frightful nuisances. 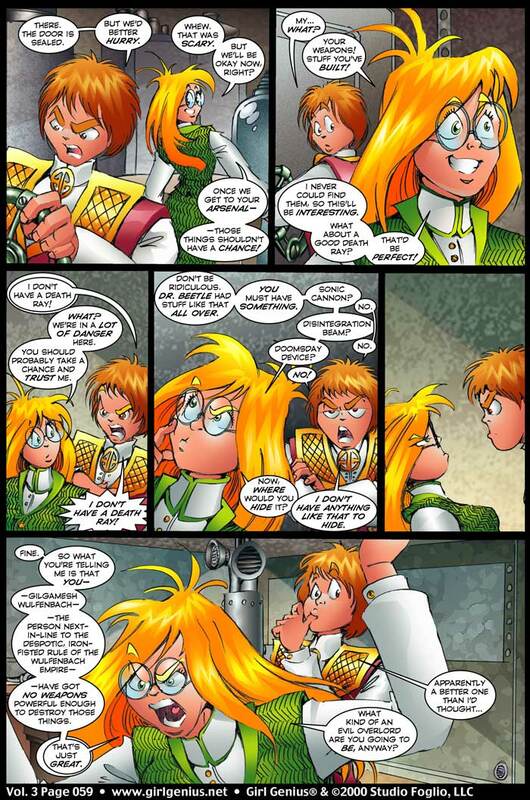 When I started Agatha H and the Airship City, I was taken completely off guard – I was expecting a spin-off story, but instead got a basic play-for-play novelization of the first three arcs of the Girl Genius webcomics (as collected in omnibus issue 1). This isn’t a bad thing at all (as I *loved* the first three volumes), but like I said, it caught me off guard. Once I adjusted to that shock, I was able to slip into the story, and immerse myself in the strange, zany, manic world of Agatha Heterodyne and her clank-making shenanigans all over again. The best parts of this book lie with the awesome force of nature that is Agatha Heterodyne – from her penchant for getting into trouble, speaking her mind, and a newfound ability to create all sorts of mechanical devices. As Agatha struggles with her own abilities (after living her whole life as something of a science-loving failure), she also must come to terms with those that want her for her talents and name. While there’s an element of romance to the story (with the equally hilarious but infuriating Gilgamesh, son of Baron Wulfenbach), Agatha has a good head on her shoulders, and does not fall into the trap of letting others treat her like property. With the help of a few unlikely friends she makes along the way, Agatha sets out on her own search for answers and adventure. And that’s really, really cool to read. The other characters are wonderful too, from the pompous and Zapp Brannigan-esque Othar Tryggvassen, to the ridiculously accented speech of the Jagermonsters, to Krosp (the talking cat) (yes, that’s right, a talking cat). Agatha H is nothing if not over-the-top, and the characters and dialogue are reflective of that. From a storytelling standpoint, novelizations of comics are difficult creatures – losing the visual element may leave even the best written comics feeling like something is missing. In the hands of skilled writers like Phil and Kaja Folgio, a story can also be told in a new and more revealing way. Even though I felt that something was lost without the Foglio’s delightful illustrations (seriously, check out the webcomic if you haven’t yet! ), the writing was beautifully, wonderfully rendered and managed to capture the vibrancy and hilarity that are the Girl Genius trademark. Also, the long prose format meant that we readers were afforded a little more insight into the emotions and inner workings of the titled heroine, as well as moments of humor that were not in the original comic. For example, early in the novelization, Agatha reflects on clanks: “Agatha always thought the watchmen clanks looked like indignant wind-up toys. Everyone did, really, until they started shooting.” Little snippets like this throughout the text give the book its own flavor and make the Foglio’s prose stand out on its own merit – not as a simple extension of the comic. 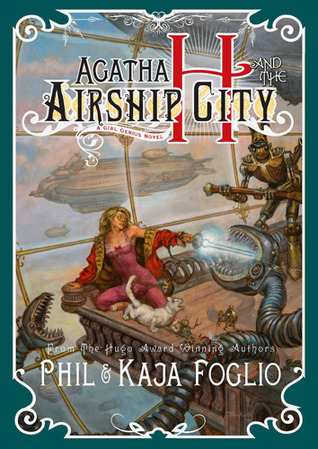 Having finished Agatha H and the Airship City, I can safely say that I am in awe of the Foglio team. ALthough I still think I prefer the webcomic format for this story, the pair do a phenomenal job of translating all the elements of the comic into prose form. Absolutely recommended for fans of the comic, for fans of steampunk and gaslamp in all its forms, and for those who have never heard of Agatha Heterodyne and are wondering where the heck to start. Agatha H and the Airship City is a bundle of exuberance, hilarity, and mad science, rolled into one irresistible package. “I. DO. NOT. HAVE. A. DEATH. RAY!” Gil shouted. “Apparently a better one than I’d thought,” Gil said, suddenly thoughtful. Notable Quotes/Parts: As I’ve said many times in this review, you really need to check out this awesome ongoing webcomic if you haven’t yet. Not only is it fun and hilarious, but it’s also FREE online. In its entirety. You can also check out a bunch of other Agatha Heterodyne goodies in the Airship Store (omnibus editions, pencil sets, goggles, etc). I love “Girl Genius”. I even managed to snag some signed copies at Melbourne’s WorldCon (with wonderful illustrations done on request), and caught the Foglio’s hilarious live ‘radio’ play. The comparison you post above is fascinating, since the plain text does not fully convey that Gil is completely ‘unthreatened’ by his lack of death rays, while the pictures do not have ‘time’ for the small business of blushes and puffing of hair. A good illustration that both mediums have their strengths and weaknesses. Oooh, goody. So it does recapture the comic, but in prose and with additions – I checked the preview chapters at webscription.net and was aware it would be a retelling. Now you’ve vouched for it I can buy with confidence . …A Girl Genius novel? I must have it! …And yet it’s so short, again! Dammit, authors, stop writing such bloody short books! I -want- to give you my money!